Jezebel is a 1938 American romantic drama film released by Warner Bros. and directed by William Wyler. It stars Bette Davis and Henry Fonda, supported by George Brent, Margaret Lindsay, Donald Crisp, Richard Cromwell, and Fay Bainter. The film was adapted by Clements Ripley, Abem Finkel, John Huston, and Robert Buckner, from the play by Owen Davis, Sr. The film tells the story of a headstrong young Southern woman during the antebellum period whose actions cost her the man she loves. The film is based on a 1933 stage play. Tallulah Bankhead was originally slated for the stage role, but fell severely ill during rehearsals and was replaced by Miriam Hopkins. In 1852 New Orleans, spoiled, strong-willed belle Julie Marsden (Bette Davis) is engaged to banker Preston "Pres" Dillard (Fonda). In retaliation for Pres refusing to drop his work and accompany her while she shops for a dress, she orders a brazen red one for the Olympus Ball, the most important ball of the year, though an unmarried woman is expected to wear a white dress. All of Julie's friends are shocked, but no one can convince her to give up her whim. At the Olympus ball, Pres and Julie's entrance is met with shock and disdain by all present. She finally realizes the magnitude of her social blunder and begs Pres to take her away, but instead he forces her to dance with him. All of the other dancers leave the floor. When the orchestra stops playing at the instruction of one of the ball's sponsors, Pres orders the conductor to continue. Pres and Julie finish the dance. Afterwards, Pres takes his leave of Julie, implicitly breaking their engagement. In a final bit of spite, Julie slaps him in the face. Aunt Belle Massey (Fay Bainter) urges her to go after Pres and beg his forgiveness, but she refuses, confident that he will return to her. Instead, he goes north on business. Julie shuts herself up in her house and refuses to see visitors. A year later, Pres finally returns, to help Dr. Livingstone (Crisp) try to convince the city authorities to take measures against an outbreak of yellow fever. At a homecoming party planned for Pres at Halcyon Plantation, the family's country estate, Julie wears a luminous white gown, and, before Pres can stop her, Julie humbles herself and begs for his forgiveness and a return of his love. Then Pres introduces her to his wife, Northerner Amy (Margaret Lindsay). Dismayed, Julie eggs on her admirer, skilled duellist Buck Cantrell (Brent), to quarrel with Pres, but the scheme goes awry. Pres's inexperienced brother Ted (Richard Cromwell) is the one who is goaded into challenging Buck to a duel. In an unexpected twist, Ted shoots and kills Buck. Then something happens that overshadows everything else. As Dr. Livingstone had warned repeatedly, a deadly epidemic of yellow fever sweeps the city, as it had done numerous times before. Pres is stricken and, like all other victims, is to be quarantined on an island. Amy prepares to go along to care for him, risking her own life, but Julie tells her that she does not know how to deal with the slaves and Southerners on the island. She begs to go in her place, as an act of redemption. Amy agrees, but only after Julie admits that Pres no longer has any love for Julie. 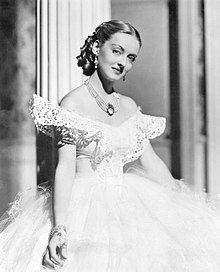 The Turner Classic Movies Database states that the film was offered as compensation for Bette Davis after she failed to win the part of Scarlett O'Hara in Gone with the Wind. Despite a radio poll showing Bette Davis the audience favorite for the role, Selznick never seriously considered her for it. This was her second Best Actress Oscar win after winning for Dangerous three years earlier. This win established her as a leading lady from this point on. Contemporary reviews were generally positive and praised Davis' performance in particular, although some found her character's redemption at the end of the film to be unconvincing. Frank S. Nugent of The New York Times wrote that the film "would have been considerably more effective ... if its heroine had remained unregenerate to the end. Miss Davis can be malignant when she chooses, and it is a shame to temper that gift for feminine spite ... It is still an interesting film, though, in spite of our sniffs at its climax." Variety reported that the film was "not without its charm" and "even completely captivating" at times, but found it detracting that the main character "suddenly metamorphoses into a figure of noble sacrifice and complete contriteness," and described the ending as "rather suspended and confusing." Film Daily called it "a really outstanding screen triumph for Bette Davis. She plays an emotional role that calls for running the gamut of emotions, and she handles the part with consummate artistry." Harrison's Reports called it "Powerful dramatic entertainment ... It is not what one would call cheerful entertainment, and may not appeal to the rank and file, but it should please those who like good acting." John Mosher of The New Yorker wrote, "Something went wrong with 'Jezebel,' possibly nothing more than the plot, and all its rich dressing-up can't make it alive ... no scene quite comes off, and at the end, when the she-devil suddenly turns into a saint and a martyr, one isn't even interested. This Jezebel just seems daffy." The film has scored more positive reviews in later years, and has a 94% rating on Rotten Tomatoes. In 2009, Jezebel was selected for the National Film Registry by the Library of Congress as "culturally, historically or aesthetically" significant, and will be preserved for all time. In 2006, film historian Jeanine Basinger recorded a comprehensive scene-by-scene commentary as part of the re-issued DVD of the film. In her commentary about Davis, Basinger relates that this film is distinctive in the realm of women's pictures because of Orry-Kelly's brilliant costume designs for the actress. Basinger states that the viewer is compelled to watch Davis in four stylings in particular: the riding crop/outfit in the beginning of the film, the scandalous scarlet red dress at the Olympus Ball, the virginal white dress she wears when she attempts to woo back Henry Fonda, and finally the cape she dons at the end of the film when she must go to help care for Fonda. In Basinger's opinion, this was the performance at the height of Davis's career and Jezebel is the quintessential American woman's film. ^ "Jezebel: Trivia". Turner Classic Movies. ^ Haver, Ronald (1980). David O. Selznick's Hollywood. Bonanza Books. p. 243. ISBN 0-517-47665-7. ^ The New York Times Film Reviews, Volume 2: 1932-1938. New York: The New York Times & Arno Press. 1970. p. 1479. ^ "Film Reviews". Variety. New York: Variety, Inc. March 16, 1938. p. 15. ^ "Reviews". Film Daily. New York: Wid's Films and Film Folk, Inc.: 6 March 11, 1938. ^ "Jezebel". Harrison's Reports. New York: Harrison's Reports, Inc.: 50 March 26, 1938. ^ Mosher, John (March 19, 1938). "The Current Cinema". The New Yorker. New York: F-R Publishing Corp. pp. 73–74. ^ "25 new titles added to National Film Registry". Yahoo News. Yahoo. 2009-12-30. Archived from the original on January 6, 2010. Retrieved 2009-12-30. Dunning, John (1998). On the Air: The Encyclopedia of Old-Time Radio. New York: Oxford University Press. ISBN 0-19-507678-8. .
Wikimedia Commons has media related to Jezebel (film).